This rare work of art is inspired by the pure geometric pattern of the star tetrahedron, also known as the Star of David, surrounded by a Mandala, a geometric design symbolic of the universe. The symbol of the star tetrahedron is recognized throughout all cultures around the world. It brings a spiritual reminder of our beginnings and a representation of life itself. 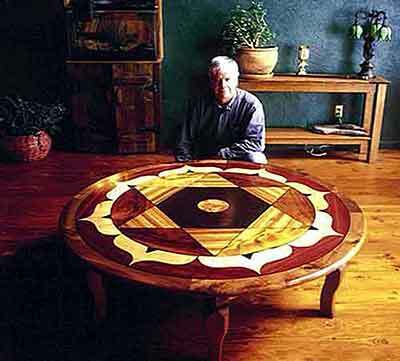 This table, an artistically crafted piece of fine furniture, features ten different hardwoods from around the world. Each wood is individually chosen for its unique graining characteristics and outstanding natural color. The legs are hand-sculpted African ribboned mahogany. This fine quality table is finished with ten coats of hand rubbed oil, bringing the natural tones of wood to life.